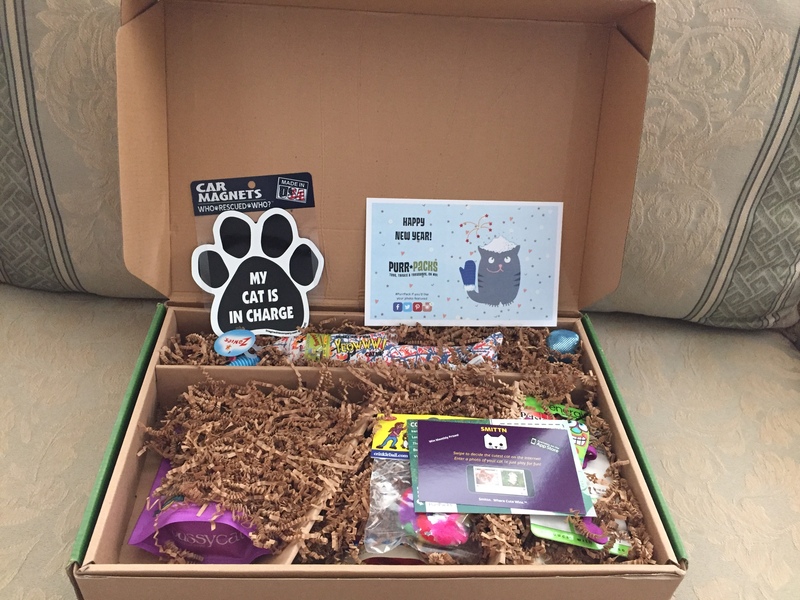 Purr-Packs is a monthly subscription box for your cats. They offer several subscription levels, from basic plans for one cat through deluxe plans for multiple cats. Purr-Packs offers 1, 3 or 6 month subscription service, all of which include name brand products for your sweet kitty, you can even choose your preferred cat snack flavor. My sweet cat Scarlet was very happy to receive a box! Scarlet received the “Fun & Love” Pack. It was filled with all kinds of goodies for her! As you can see, Scarlet loves her goodies! She loves to play with toys, and loves treats, so this monthly subscription is perfect for her. It was like Christmas for her when we received the box. Once I brought it inside and put it on the floor, she came right over and was sniffing it. They even sprinkle catnip inside the box! The items in the box were of high quality, and definitely not cheap. I love how the cat treats are made of all natural ingredients, so I can feel good giving them to my precious kitty. 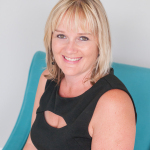 What I love about this company is Purr-Packs donates at least 10% of all retail subscription profits to local and national rescue and/or adoption programs! We rescued Scarlett, so this cause is near and dear to my heart. It is exciting to look forward to see what she will receive each month. To find out more information, and order your monthly subscription, click here. These monthly boxes sound awesome. I know a lot of people that would love these. I might have to see about gifting them a subscription. Thank you! My cats would LOVE this!! I just tried to enter via the Rafflecopter and it said it hasn’t started yet…? 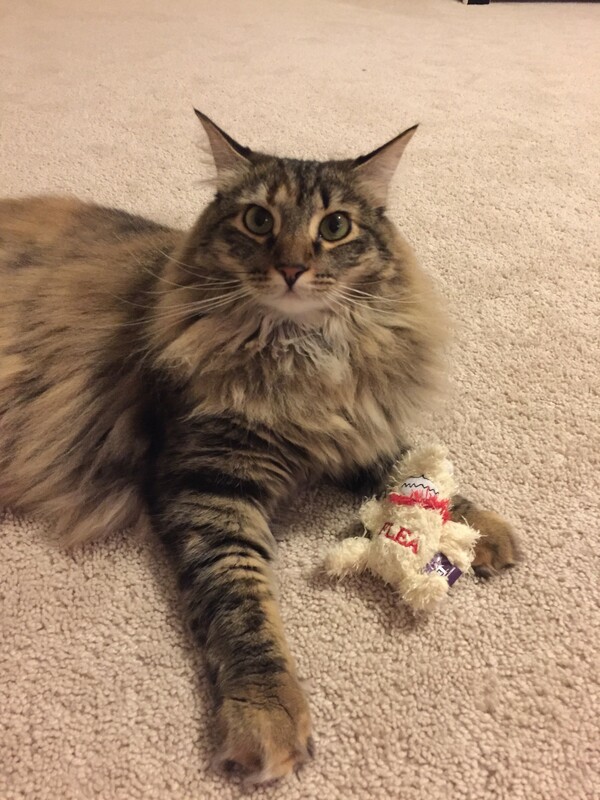 My cat would love Purr-Packs because she loves trying new treats & playing with toys! Oh my cat would love this! She gets bored with her toys easily, so this would be great to mix things up. What a great idea for cat lovers! It sounds like a great idea for all cat parents! I have 5 cats they would love purr packs so they feel even more spoiled than what they are. I love everything in there! my willow would love this! she’s been feeling left out since the dog got a barkbox last year. I would give the box to my niece and nephew. They have two kittens. Oh my gosh, my cats would just love this. They love getting surprises in the mail. Oh how fun! They have a lot of boxes for dogs and they have mix boxes. I think this is the first time I have seen a box just for cats! I should order one for my mothers cats. i would love to give these to my kitties because they love toys and treats! my boy Buddy looks just like your furbaby! Look how cute she is! My cat would love this subscription box. Anything string-like or edible and she’s a fan. I have teo cats, Mepp and Hazel, and I bet thye woul dget a kick out of this. Your cat is simply gorgeous! It definitely looks like Scarlet loves her Purr Pack! I love how there are subscription boxes for every type of person with interest and animals too! They are just like family! What a fun box! I have a friend who has a solo cat and she travels a lot. This would be perfect for her. My Desiree would love it because she playing is one of her favorite things to do (she’s nearly 7 yrs. 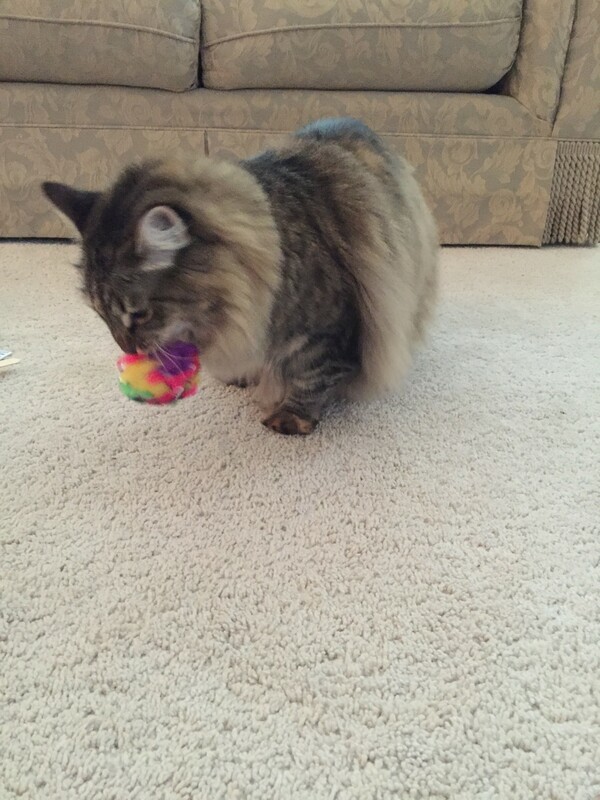 old and still plays like a kitten) and she enjoys getting new toys. Before I saw the giveaway I was saying I should get this for Peanut (my cat). one of these boxes would be good for him because he gets bored with toys so easily. Something new each month would be good for him. I have two cats this box would be perfect for. This would make a great gift idea for any cat lover. I don’t get my cat new toys often so he would be excited to have some new toys and treats. Our fur babies love to get stuff too! What a fun way to try out new pet products – it’ll keep it fresh for them month to month! 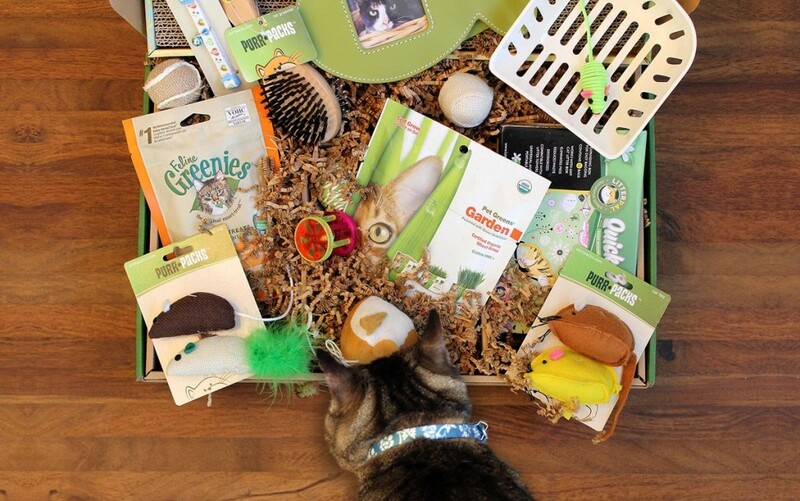 What a fun subscription box for pet lovers! I love that they have different options! I love a good subscription box. If I had a cute little fur baby they would definitely have the Purr Pack. May get it for my good friend and her cat. I love how the subcription boxes are migrating to the fur babies! Looks like a fun box with lots of goodies! 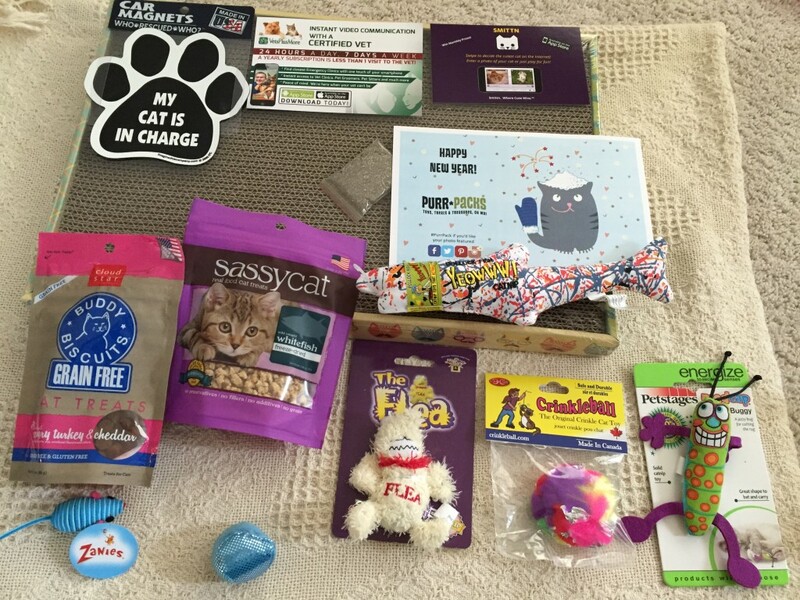 Looks like they have a lot of great things for felines and my cat, Misty, would be excited to receive the goodies. Thanks. My cat, roo, would love this because he loves to play! My cat would love to win a purr pack! He loves trying out new treats and toys and I love getting things for him. I have 3 kitties that would love this because they love getting new interesting toys and sampling new treats! Between my 2 cats, I am sure we would use and love it all. I have 3 cats that would be sharing this. They would love this because they feel they deserve everything. they are the rulers of the house and I am here just to bring them things to please them. My cat would love this because she loves to play and would love new toys. 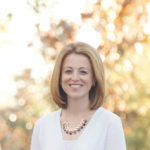 I commented on the Canvas Discount Offers Exclusive Valentine’s Day Deal – $9.99 for a 20×16″ Canvas Print post as Melissa S.
I’d give this to my mom for her kitties to play with. This is perfect for my cat. He loves toys and treats! My cats would love this because they get so excited with any new toy or treat. Thank you for the chance!